1 		THE COURT: 60-day notice. And that expired when? 2 		MS. MILLARD: The 11th of -- the 11th of May? 5 		MS. MILLARD: Yes, he is. 8  daily damages, and cost of suit. Is that correct? 9 		MS. Millard: I'm sorry, sir? 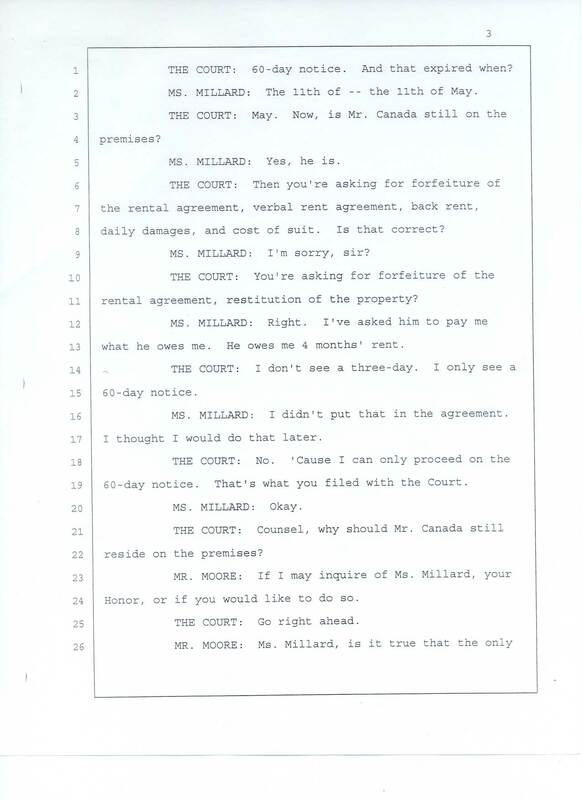 11 rental agreement, restitution of the property? 13 what he owes me. He owes me 4 month's rent. 16 		MS. MILLARD: I didn't put that in the agreement. 17 I thought I would do that later. 19 60-day notice. That's what you filed with the Court. 22 reside on the premises? 21 Honor, or if you would like to do so. 25 		THE COURT: Go right ahead.